They say that any war can be ended by a single, well-placed assassin. Ubisoft Paris proves this to be true with what is surely their final salvo in the ongoing Paris Post-It war. Sometimes you just have to think outside the window. For months, Ubisoft Paris and its neighbor, French bank BNP, have been firing Post-It Note video game characters bank and forth, a lone Space Invader on an Ubisoft employee's window sparking a competition that quickly grew out of hand. Earlier this month we documented the battle here on Kotaku. The two sides' creations were impressive, as was their dedication to crafting paper video game characters when they should have been designing video games or handling other people's money. Ezio from Assassin's Creed made his first pixelated appearance during the early days of the battle, staring calmly across the distance separating the combatants, a harbinger of things to come. He warned them. And now he has come. 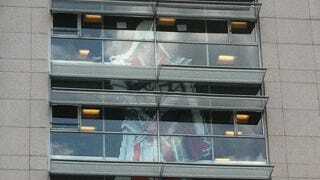 Standing a massive three stories tall, this paper pixel version of the assassin Ezio has given up his stealthy ways in order to deliver a message to the folks at BNP: You shall not win this battle. Lay down your Post-Its and go back to work. Is this truly the end of the Great Paris Post-It War?